In this paper we touch upon the request for dynamic synthetic signing by discussing requirements for accessibility via Sign Language for information retrieval and dynamic composition of new content. The key issues remain the option for reuse of pre-existing signed “text” along with the exploitation of basic editing facilities similar to those available for written text. 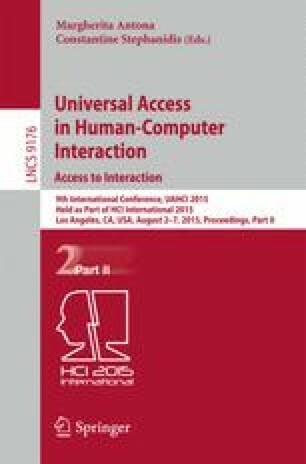 We present an approach to the development of intuitive HCI interfaces for dynamic synthetic signing, while synthetic sign content is presented to the user by means of a signing virtual agent (i.e. avatar). The research leading to these results has received funding from POLYTROPON project (KRIPIS-GSRT, MIS: 448306) and is based on insights, technologies and language resources initially developed within the Dicta-Sign project (FP7-ICT, grant agreement n°: 231135).